Despite numerous studies demonstrating the benefits of genetic modification (GM) technology — particularly its potential to increase food security in developing regions — the jury is still out on transgenic (genetically modified) crops. Publics around the world remain concerned about suspected potential risks, and media messages are often mixed. In this opinion piece, Dr. Ademola Adenle from UNU-IAS looks at the issues surrounding the adoption of GM crops and addresses the contentious question of “are transgenic crops safe?” He argues that transgenic crops should be given a chance in Africa to help solve the continent’s food, agriculture and human security challenges. The controversies surrounding transgenic crops — a type of genetically modified organisms (GMOs) — underline the need to raise public awareness on GM technology in Africa. Around the globe, GM crop-producing countries have benefited by improved crop productivity, food security and quality of life. Increased income to resource-poor farmers has been a key benefit at the individual level, especially as most countries using this technology are in the developing world, including in Africa. However, given the ongoing debate, thorough scientific investigation into the safe application of GMOs is required, and should be accomplished by educating the public on the potential benefits and risks. Why should GMOs be given a chance in Africa? A growing body of evidence documents increased crop yields, higher farm income, and health and environment benefits associated with GM crops. In 1996, when GM crops were first officially commercialized, six countries around the world planted a total of 1.7 million hectares of GM crops. By 2010 this had grown to 148 million hectares in 29 countries (of which 19 countries were in the developing world). This 87-fold growth makes GM the fastest growing crop technology adopted in modern agriculture. Of 15.4 million farmers that planted GM crops in 2010, over 90 percent (14.4 million) were resource-poor farmers in developing countries, including in three African countries: Burkina Faso, South Africa and Egypt. Almost 100,000 farmers in Burkina Faso cultivated GM cotton on 260,000 hectares in 2010 (representing a 126 percent increase from 2009), and GM crops are estimated to have benefited Burkina Faso’s economy by over US$100 million per year. Similarly, in South Africa, the first and biggest producer of GM crops in Africa, GM technology is reported to have enhanced farm income by US$156 million in the period 1998 to 2006. South Africa is the only African country among the five principal GM-producing countries (along with India, Argentina, Brazil and China), and farmers there planted 63 million hectares of GM crops in 2010 alone. While there are many documented benefits of GM crops, in contrast, there are few documented cases of potential health effects or economic drawbacks. Over the period of time that commercially available GM foods have been produced, no studies have indicated that GM foods are less safe than traditional counterparts. Nevertheless, the potential/perceived risks caused by GMOs continues to attract attention, particularly in Europe and further afield in the international media, which has led many people to condemn GMOs outright based upon unverified sources. Claims that GMOs could pose health risks to human beings, however, tend to be based on individual works promoted on websites or by NGOs, and are not backed-up by scientific research. Moreover, the World Health Organization and the Food and Agriculture Organization of the United Nations have concluded that there is no scientific evidence that the application of GM technology has resulted in substantial human health effects or environmental problems. In spite of the lack of evidence, however, most European countries do not grow GM crops because European legislation has adopted a “precautionary principle” to ban GM crops. Many policymakers and organizations in Africa thus see GM technology as something that should be avoided. In part, this can be attributed to a lack of awareness and education on the application of modern biotechnology. The public needs to be educated on both the potential economic benefits of GM crops and the general lack of scientific evidence of health-related issues when GM crops are consumed. Given the high level of poverty, malnutrition and hunger and the low level of agricultural productivity in Africa, GM technology has great potential to offer solutions. But the controversy over the use of GM technology remains one of the biggest threats to its broad-based adoption. The current regulatory approaches of the United States (US) and the European Union (EU) can play an important role in the adoption of GM technology in developing countries, particularly in Africa. While the US can allow commercial release of GMO products based upon standard tests, in the EU, GMO products can be stopped based upon scientific uncertainty alone according to the “precautionary principle”. This precautionary principle has become a political tussle: reports have shown that developing countries in Africa and elsewhere consider their trade relationships with the EU before adopting GM crops, due to the fear of losing market access. As a result, African governments tend to exhibit a “go slow approach” towards GM technology, reflected in delayed approval of biosafety laws and lack of a biosafety system in many African countries. This caution is not restricted to African countries; other developing countries are suffering a similar fate. Moreover, it is unclear what roles international organizations such as the World Trade Organization and the Convention on Biological Diversity are playing in mediating the disputes between the US and the EU. However, evidence shows that GM technology has great potential to improve agricultural productivity and farmers′ livelihoods in developing countries. GM technology must be allowed to play a part in alleviating hunger and poverty in Africa. Given both the lack of global consensus on GMOs and the growing need to regulate GMO products, the US may offer a good example for Africa and the rest of the world. It is one of the few developed countries to grow GM crops on a commercial basis (more than 70 per cent of foods in the US contain GMOs) and is a leader in the safe application of GMO products. Prior to releasing GMO products for human consumption in the US, products are compared with traditional counterparts in a variety of chemical, genetic, biochemical, compositional, nutritional and environmental tests as well as in comparison with known allergens. The US Food and Drug Administration (FDA) monitors all products containing GMOs through comprehensive safety and environmental testing. Other GM-producing countries, including Canada, Australia, China and Argentina, are carrying out similar tests to ensure that GMO products are safe for human consumption. However, the US FDA cannot be compared with the majority of food and drug regulation departments in African countries, as the US — like many GM producing countries — has an effective regulatory system with an excellent track record in food safety. Nonetheless, with support from developed countries, it should be possible to increase local capacity for testing in Africa, and this should ensure the safe delivery of GMO products. Africa’s relatively slow embrace of the “gene revolution”, particularly GM technology, has, in part, stemmed from lack of access to GM crops available to beneficiaries such as farmers and scientists. This is partly due to international influence against GMOs. Some hope, however, lies on the horizon, as the African Agricultural Technology Foundation is working to promote public-private partnerships to ensure that resource-poor farmers have access to technologies including GM. 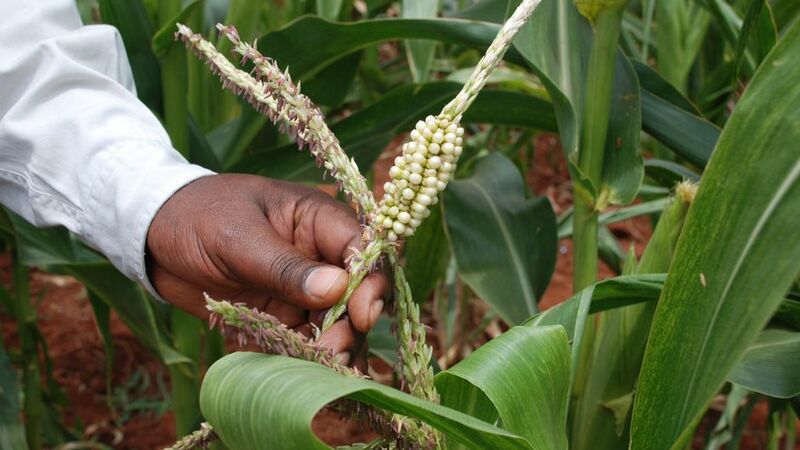 Efforts are also underway to develop GM crops that can benefit African farmers. Agriculture plays a significant role in the economy of African countries in terms of gross domestic product, international trade, industrial development and creation of job opportunities. There is an urgent need to improve agricultural production. GM technology can be a part of the solution, in cases where traditional methods of farming have been less efficient. The potential benefits of GM crops for alleviating poverty and hunger, and improving agricultural productivity, health and food security, cannot be over-looked. Yet the adoption of GM technology is currently faced with several constraints: lack of infrastructure, inadequate human resource capacity, poor education, biosafety regulation and concerns over intellectual property rights. African farmers need fast technology that can solve part of their agricultural problems. A concerted effort from developed countries must be put in place to ensure that Africa benefits from this new technology. African governments must also take the lead to come up with coherent strategies for adopting modern biotechnology and educating the public and key beneficiaries to increase understanding of transgenic crops. This article is an abbreviated version of Adenle, A.A “Response to issues on GM agriculture in Africa: Are transgenic crops safe?”, BMC Research Notes 2011, Vol. 4:388. Are Transgenic Crops Safe? GM Agriculture in Africa by Ademola Adenle is licensed under a Creative Commons Attribution-NonCommercial-ShareAlike 3.0 Unported License. patented seeds and special chemicals – how is that increasing food security? It increases debt like the case of India, does it not? Why can government or aid-backed organisations not instead support collecting heirloom varieties of seed, selecting the best performers and then creating central and decentralised seed banks? These seeds grow true to type year after year, and the farmer needs only collect some seed from their harvest, and can depend on those seeds the next year. Totally agree with true_solutionz_now. It is really disingenuous to talk about GMO and not talk about the financing structure, the debt farmers incur, the absolute reliance on chemicals, and the profiteering from WESTERN companies when using patented seeds. GMO is NOT the solution for Africa. As a non-expert on this issue, I am willing and should listen to the expert views of scientists about the safety or otherwise of GMOs. However, what the natural scientists having this debate often fail to understand is that hard, natural science alone is unable to equip us to make a decision as complex and potentially risky as accepting GMOs. When only a handful of companies in the world control most of the seed for the world’s major crop, this becomes a question about power, inequality and injustice. And to understand questions about power, inequality and injustice, we need to be humble enough to ALSO take advice from social scientists, philosophers and historians who are equally expert in their fields. In this case, the GMO debate lies at the intersection of natural and social sciences and therefore must include a variety of leading thinkers to guide a society. So to see this as only a technical issue as the author does, it to repeat mistakes made over the years on a whole variety of endeavours of technological progress that concentrate power into the hands of a few, at the expense of the many. Ask yourself who will really gain from the use of GM in Africa or elsewhere? Do the people promoting GM really have the interests of the African farmers at heart? Is this about food security or really just about agro-industrial profits? Spot on!! This doesn’t mention the thousands of farmers that have committed suicide in India since taking up GM. Before that they simply saved their seed every year like they always have. Heirlooms are better suited to local conditions and are more nutritious and better tasting than modern hybrids or gm seeds. I hate the fact that vegetables don’t taste good anymore like they used to because they have been bread to be bigger, more deseases resistant, more uniform etc at the expense of taste and health. bans on GM-foods originating from the U.S.A. as an illegal act. gloves off when it comes to eliminating threats. Mate you have worked this one out perfectly! Look, i don’t know where is man or PHD holder attended school or got his fact from, i believe he is brain washed … for these conglomerators whose aim is to dominate the food industry and take control of the world. Even in USA about 75 senators voted against the introduction of GMO technology and stated clearly that the options available for GMO crops to exist in the country is when /; Farmers are able to clearly indicate and label crops in order for consumers to have a choice in choosing whether to go GMO or Organic” My dear PHD holder, do you think if there was nothing wrong with these technology, Such a number of senators would vote against it? Look we know that if these crops are adopted, it will concentrate power in a few hands and that will lead to crisis and disaster. Can imagine what power will be concentrated in a few hands when these technologies are adopted? what it means is that, the promoters of GMO crops will now control the entire country because you will need to purchase their seeds in order to farm, and so if one day they go mad and decides not to sell the seedlings a particular country, can you imagine what will happen? Wise up professor, what is wrong is wrong! GMO crops brings about Health Issues which includes, heart problems, cancer, stroke and other serious illnesses. In the USA for instance, ORGANIC foods are more expensive then GMO Foods. Guess why? ( The answer is just so simple ” IT IS BECAUSE ORGANIC FOODS ARE MORE SAFER, NICER, TASTES BETTER AND MORE NUTRITIOUS THAN GMO CROPS” Hence the price difference!